It is quite a quick and easy top to sew. The instructions are very clear and it comes in a range of sizes, and also two sleeve lengths. I fell between sizes so made the size 2, which fits well around the shoulders and bust, however, I feel I could possible go down a size around the waist and hips, and possible shorten it a little. I love the slight boatneck neckline, and it is a very comfortable top to wear. This one is made from a dark grey merino blend, which will be perfect for trans seasonal layering . I'd like to try a striped one next with 3/4 length sleeves. It's starting to look like Spring at the Auckland Botanic Gardens. The magnolias were in full bloom and absolutely beautiful, and the Tui's were loving the nectar from these early flowering blossoms. My friend and I had to laugh at these sparrows sheltering from the rain. Now that I have finished my Solstice Dream and Seaglass Sampler quilt, I was needing something to keep my hands occupied at night. (Housework doesn't count) I had a canvas work pattern that my sister had given me a couple of years ago, so decided that this would be the perfect opportunity to pull it out and work on it. Of course I had none of the equipment or threads it needed, so had a special trip into my favourite craft store - Ribbon Rose to purchase them. A couple of threads weren't available, so these have been substituted. The pattern itself is called Catch a Falling Star and is a design from Nancy's Needle. Most of her patterns are based on quilts, there are some beautiful designs available. Stitching the design itself is quite easy, the only difficulty I found was in the beginning and trying to count the threads and spaces on the canvas, they are tiny. Since then, I have done a decent sized block, and it is a lot easier to work out where things fit. I suspect at some point, I will need to invest in a magnifying lamp for my hand work. The finished piece will end up at just over 7"square. I am really enjoying doing this, while I think about my next project or two. During the weekend, my cousin had her first child - a little girl, so finally I can reveal the secret sewing my sister and I have been doing. Earlier this year when we found out she was pregnant, my sister @janinemehrtens suggested that we make her a wall hanging for the baby's room. I agreed to the plan as long as I was told what I was doing. So my sister who lives in Australia designed our pattern, to the theme of the children's classic picture book - A Very Hungry Caterpillar by Eric Carle. She made half the blocks, including the fabulous caterpillar, fruit (check out the detailing on those strawberries and oranges) and cherry pie and then sent them to me with background felt ( which is a very pale blue, so I could make mine, and backing fabric and binding to finish it off. It was backed and bound in a coordinating print from from Andover Fabrics Hungry Caterpillar collection. It has now been posted off to my cousin, along with a piece of dowling cut to fit, so it was ready to hang and a copy of the book for many future story times. Some time in 2016 my sewing friends and I started a sampler quilt. We each took turns to choose the blocks were were going to make. Miss B thought she'd like her own sampler quilt, so picked her colour palette - which we called sea glass. We set up a pinterest board of images which inspired the colours I used. 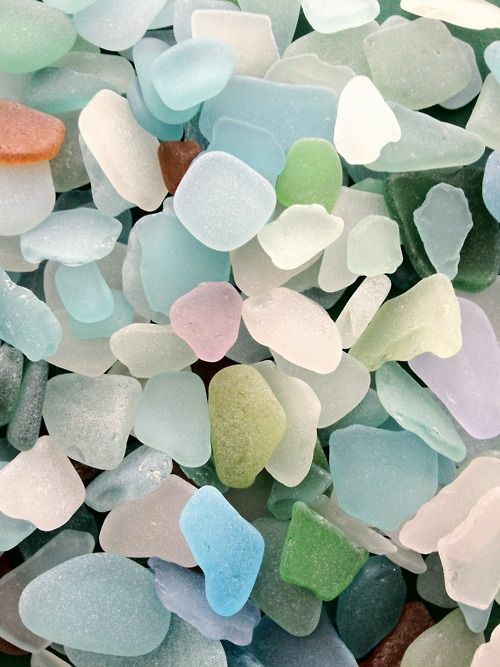 Who knew there were so many different colours of sea glass you can find. Along the way, I started making blocks that I wanted to trial, I used some precious little scraps of fabric and a piece of vintage lace/tatting that was my Gran's. For quite a while all these blocks sat in a box, while I got distracted with new projects. Earlier this year I made it my goal to get all these blocks pieced together and turned into a quilt top, the aim being that Miss B would receive it on her birthday at the end of April. Epic fail on my part, but I can now report that the Sea glass Sampler quilt is finished. It has been randomly hand quilted in 2 variegated blue threads, that mostly blend in with the denim backing, but highlight the fabrics and blocks on the front. Binding is a very vibrant green and periwinkle print from Tula Pink. It's a little crumpled and crinkly in these photos, as it was fresh from the dryer after spraying with water to remove my marking pen lines. Tonight it will go on Miss B's bed, where I am sure Meeka will appreciate it too. Janine's is on the left, mine is on the right. Seven months and 10 days after I started the first stitch of my Solstice Dreams project, I have finished it. This was a project that my sister @janinemehrtens who lives in Australia and I were both making. The pattern was from Kerry Stitch Designs. and was made up of various sized felt blocks featuring wool felt applique and embroidery. I have shown some of the same blocks we did, but how our own styles and tastes have made them different. This has been a fun project to do, even if I had a few upsets with incorrectly sized blocks I had to redo. Both have been packaged up ready to be sent to Leeanne at QuiltmeKiwi to work her quilting magic on them.